Our goal in these conversations was to provide local programs with as much information about our operations (within the limits of our client confidentiality) as possible, so that they could make informed decisions on how best to serve their clients. More specifically, questions ranged from how to correctly use an individual cell phone SMS service to provide anonymous domestic violence counseling services, to how to go about selecting a chat vendor that could effectively limit services to a certain geographic area. 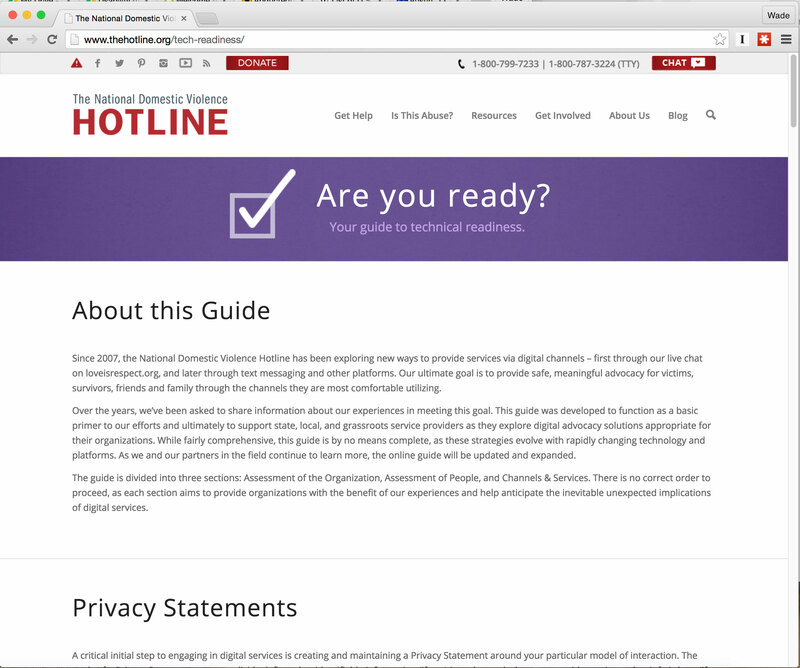 As a result of these conversations, we created a digital preparedness toolkit for domestic violence programs. Unlike other national-based resources, this toolkit is free of charge and updated on a regular basis, allowing programs to adapt guidance and polices as needed. The toolkit is considered a constant work in progress, incorporating feedback from programs, and taking into account new policies, technologies, and methodologies, as they become available. Ultimately, our goal with this project is to share our successes and our short comings in the area of victim service, in the hope of helping more victims of domestic violence, and meeting them on the channels on which they are most comfortable engaging. How to establish and maintain a safe environment on social media platforms. Best practices for launching web-based advocacy services, such as one-on-one chat. Providing text-messaging services both with both platform-based and device-based strategies. Advice on creating, conforming to, and updating privacy policies around digital services. Considerations for privacy, in regards to the Family Violence Prevention Services Act (FVPSA) the Violence Against Women Act (VAWA) and the Children’s Online Privacy Act (COPA).